The second DVD out of the box as I work through my birthday present to myself, is JJ Abram’s Star Trek from last year (2009). Star Trek is a film with a wonderful flora of quotes, but so many of the good ones are in-jokes for fans of the original series. I choose to illustrate instead one of the most puzzling features of the future. The lack of development in prosthodontics. Poor Leonard Nimmoy, the original Spock, reappears (through one of those handy wormholes in the time-space continuum that Science Fiction films thrive upon), sucked away from 24th century, and masticates his lines through what appear at times to be rather ill-fitting dentures. In my imagination I hear him advising his younger self. 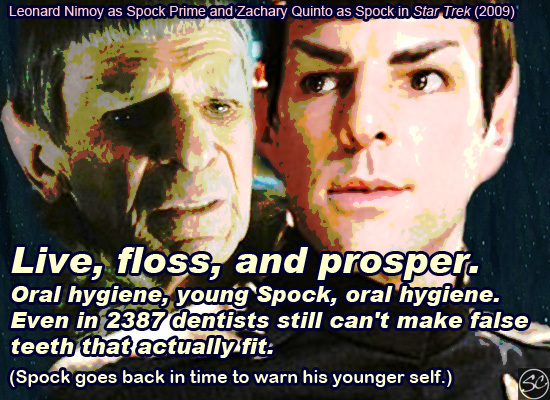 Oral hygiene, young Spock, oral hygiene. Even in 2387 dentists still can’t make false teeth that actually fit. The Internet Movie Database page for Star Trek (2009) here. The official site for Star Trek (2009) here. That’s hilarious! Live, floss and prosper… hahaha! I have not seen Star Trek from 2009 but now I’ll just have to. See it for the visual experience and the jokes (which are funny even if you’ve not seen the original TV series). I think the makers desperately wanted it to be a film that would appeal to women as well as men, but I’m not sure they succeeded. The next film in the series, though, which won’t be quite so tied to the original series, ought to be more successful in that respect.